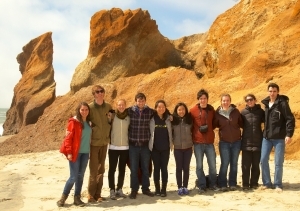 Building on the success of Winter Break at Harvard Forest and the annual weekend trip to Martha's Vineyard as part of our Freshman Seminar, in 2017 we are offering an immersive, interdisciplinary, 4-day Spring Recess Trip to the Vineyard for Harvard students (FAS undergraduate and GSAS graduate students from all concentrations). The Island of Martha's Vineyard -- a site of decades of ongoing Harvard Forest research -- has been shaped by wind, glaciers, and countless storms, as well as generations of farmers, fishermen, artists, conservationists, Wampanoag people – and, of course, droves of summer vacationers. During the spring trip, in daily hands-on field walks, students will explore both the well-known and little-known history and ecology of the Island, try landscape art and writing in guided workshops, and learn up-close how individuals, organizations, governments, and businesses manage their corner of the Vineyard landscape. With guidance from Professor David Foster (OEB / Director of Harvard Forest), students will explore in-depth many of the themes in a new book and set of maps about the Island. Applications for the 2017 program closed December 23, 2016. Please contact hart3@fas.harvard.edu if you are interested in joining the waiting list.